.NET Reactor is a powerful .NET code protection system which completely stops any decompiling. Developers are able to protect their software in a safe and simple way without worrying how to protect their intellectual property. Why you need to protect your intellectual property. When you compile a program written for the Microsoft .NET framework, the program you provide to your users is not compiled into a native executable program, but instead is translated into something called the Common Intermediate Language instructions (CIL). CIL is half way between source code and native code, and is interpreted by the .NET framework when your program is run, rather than executed directly as machine code. Because of this, the source code of your application or library can be easily reproduced. Tools such as .NET Reflector (www.red-gate.com/products/reflector/) can reproduce source code from a compiled .NET assemblies in seconds, and in the .NET language of your choice! Clearly, commercial software distributed to end users without some form of protection is wide open to piracy and intellectual property theft. 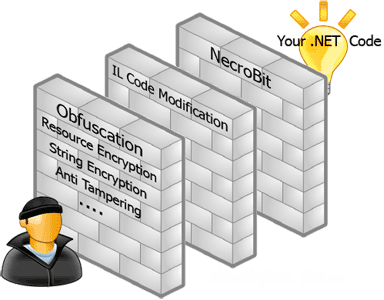 The traditional solution to intellectual property protection in .NET is to use ‘obfuscation’, indeed Microsoft make an obfuscation utility available to Visual Studio users. So why is obsfucation not enough? Obfuscation is the process of making your source code more difficult (but not impossible) for humans to understand. Obfuscation works by replacing the meaningful names you assign to classes, methods, properties and variables with meaningless ones. For example, it may replace a variable name of “counter” with “A4DF3CV89G” – to humans these obfuscated names are confusing and difficult to remember, but have no effect on the NET Framework interpreter. Note that obfuscation does nothing to the source code within your methods, so it is not protected at all by obfuscation. .NET Reactor does everything an obfuscator does, but then wraps your intellectual property in several more layers of protection, denying access to your source code to even those who are determined to steal your hard work. .NET Reactor’s protection has never been cracked, something which cannot be said about obfuscators. The native code wall created by .NET Reactor between the hacker and your source includes industry leading NecroBit technology, which is exclusive to .NET Reactor. .NET Reactor’s protection has never been broken since the first release in 2004. These technologies make reconstruction of your source code more difficult by so many orders of magnitude that NecroBit is by far the most effective protection you can use for .NET assemblies. arrow rightProtect your revenue by enforcing trial version restrictions and full version licensing terms.